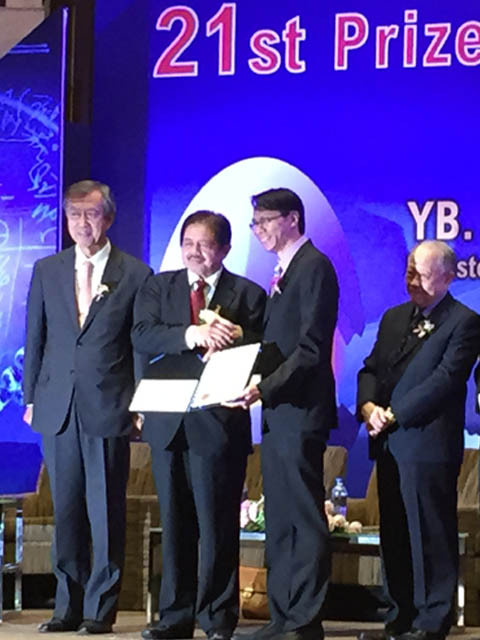 Three UTAR researchers received the Science and Technology Research Grants (STRG) from the Minister of Science, Technology & Innovation YB Datuk Dr Ewon Ebin at the 21st Prize Presentation Ceremony of Malaysia Toray Science Foundation (MTSF), held at the InterContinental Hotel, Kuala Lumpur on 2 December 2014. YB Datuk Dr Ewon Ebin in his message said that winning an award or prize from MTSF is a significant achievement, given the acceptance and prestigious status that the awards and prizes have attained over the past two decades. The aim of the grant is to promote science and technology through supporting deserving young Malaysian researchers and science educators. A total of 36 scientists and researchers from various universities (including UTAR) received the awards and cash for their work in science, technology and innovation. 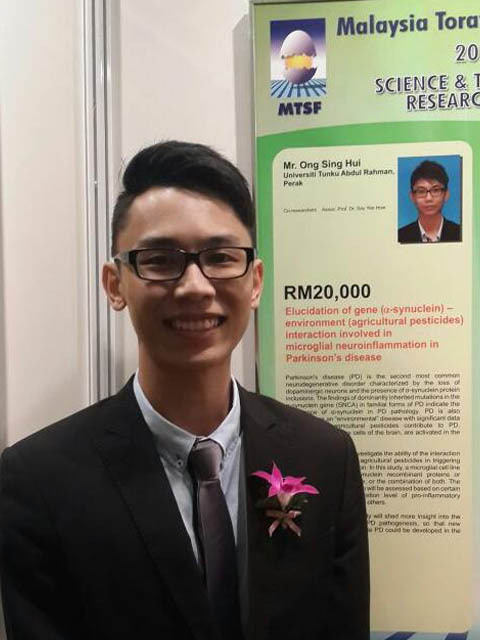 The UTAR researchers who received the MTSF-STRG grants were Ong Sing Hui from Department of Biomedical Science, Faculty of Science (FSc), Wong Chee Yin, Faculty of Medicine and Health Sciences (FMHS) and Tan Jiunn Luh from Department of Agriculture and Food Science, FSc. Ong received the grant of RM20,000 for his research work on ‘Elucidation of gene (a-synuclein) – environment (agricultural pesticides) interaction involved in microglial neuroinflammation in Parkinson’s disease (PD).’ He expressed hope that the research study will help to develop more therapeutic measures for PD which is a common neurodegenerative disorder. His co-researcher is Associate Prof Dr Say Yee How. Expressing that it was an honour to be recognised by MTSF, FMHS Wong said, “I will utilize the given grant of RM15,000 towards creating more value for my fundamental research on stem cells that focus on translating my research results into new medical treatments to help those affected by renal diseases.” Wong received the grant amount for his research project on ‘Decoding the differentiation of mesenchymal stem cells to mesangial cells at transcriptomic level.’ Wong’s co-researcher is Prof Lim Yang Mooi and his research study is also with co-supervision from the Dean of FMHS Prof Emeritus Dr Cheong Soon Keng. 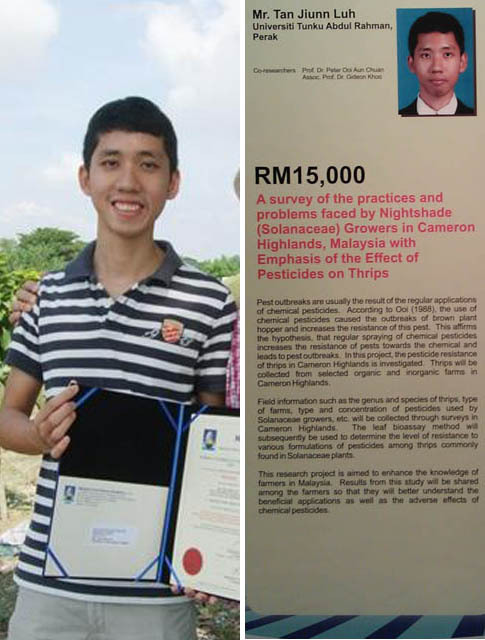 Tan also received RM15,000 in the MTSF grant amount for his research project on ‘A survey of the Practice and Problems faced by the Nightshade (Solanaceae) Growers in Cameron Highlands, Malaysia with emphasis of the effect of Pesticides in Thrips.’ Elaborating on the purpose of his research study, Tan said, “By proving the cause of thrips (the pest in my research) and also the reason for the thrips to be resistant to the insecticides, we will justify to find the biological control agent for the thrip.” He further added that he would make good use of the MTSF grant to complete his research and help the farmers of Cameron Highlands solve the agricultural pest problems and harvest better and healthier produce. Tan’s co-researchers are Prof Dr Peter Ooi Aun Chuan and Associate Prof Dr Gideon Khoo. All the three UTAR researchers expressed their gratitude to the University, their supervisors, families and friends for the support in their research studies as well as the encouragement in applying for MTSF- STRG 2014. Malaysia Toray Science Foundation (MTSF), a registered and privately funded charity organisation is established by Toray Industries Inc. Japan. Its mission is to contribute to advancement of science and technology in Malaysia.